← I made it ! Round 4 of SOSM! 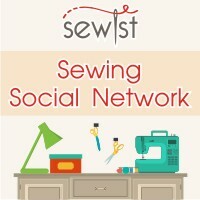 I’m competing in the Super Online Sewing Match II hosted by Sew Mama Sew and I have made it to Round Four. In between each round the contestants are asked to answer a sewing related question. 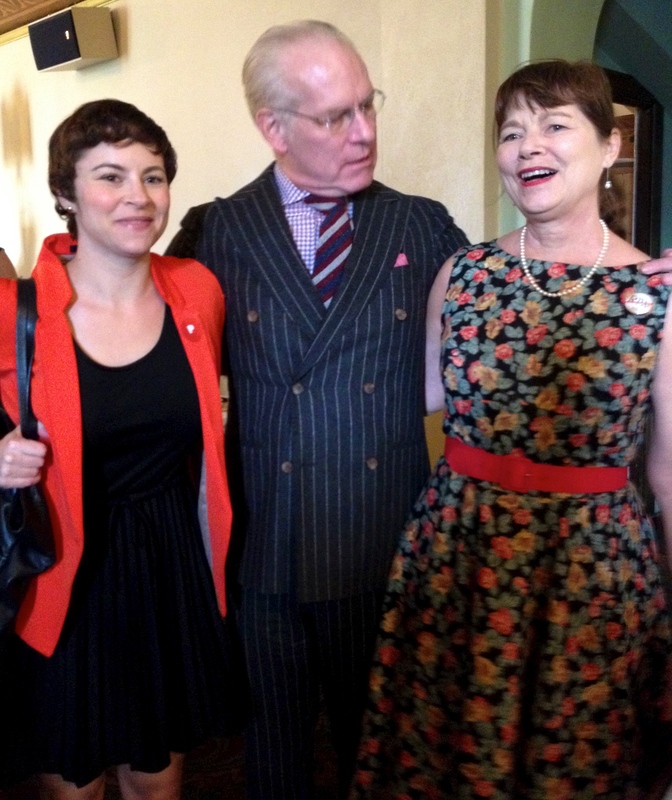 For Round Four, the question is, “What is the best thing You’ve ever sewn?” Without any hesitation I’m going to say that the dress I made to meet Tim Gunn is definitely the “BEST”! 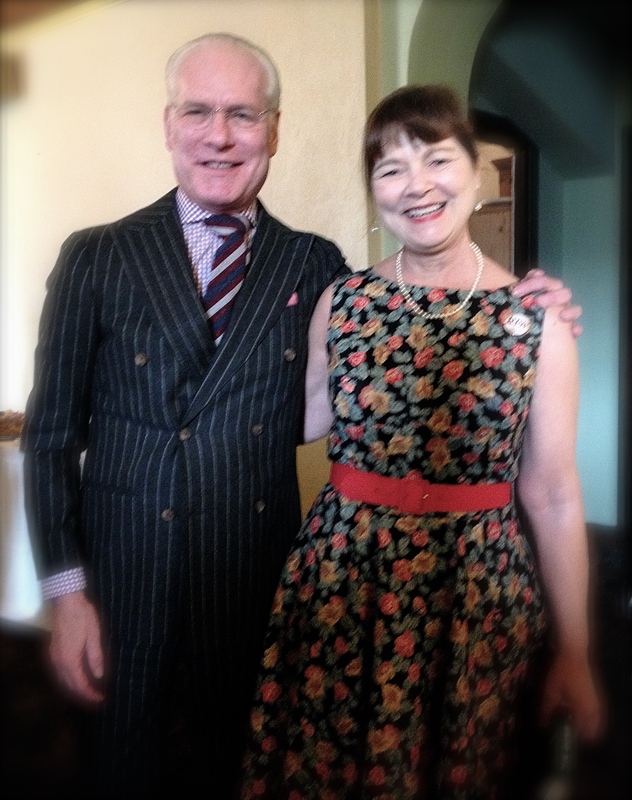 I attended a discussion and book signing of the well-know television personality and author, Tim Gunn at the Castro Theatre in San Francisco. 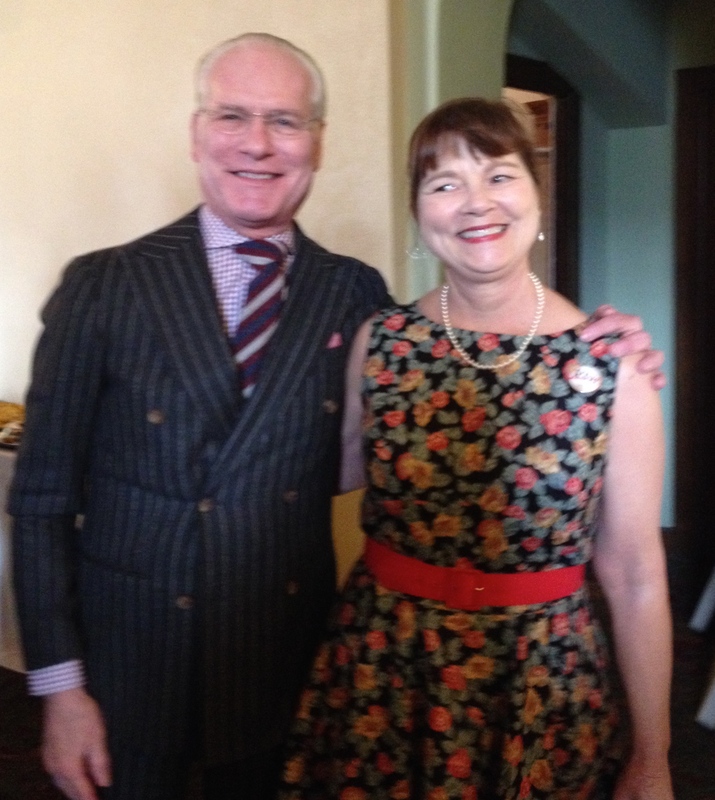 You can imagine that I was more than excited to meet Tim and listen to him speak so personally about his life, his experiences on Project Runway, and about his new book, “Tim Gunn: the Natty Professor”. 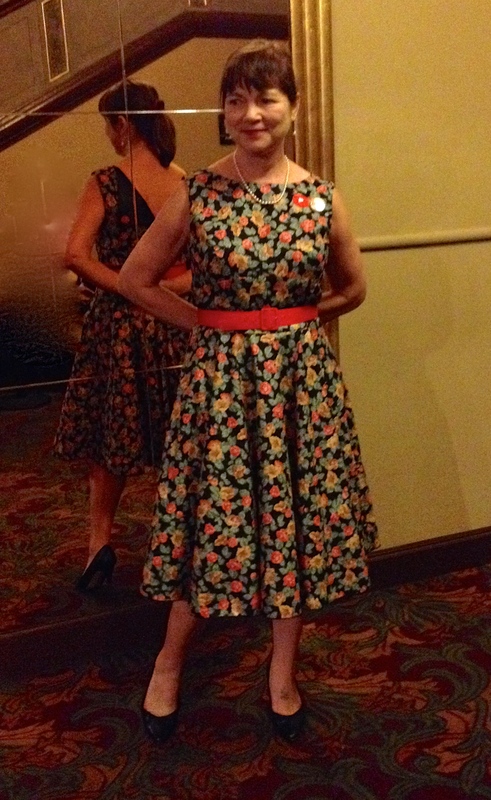 I had to make a new dress for this special event, so I chose Gertie’s vintage inspired Butterick 6094. It has a close fitting lined bodice and contrasting facings. Version A has a full circle skirt cut on the bias, and a petticoat. It has the cutest back detail, with the contrasting fabric opened out above the zipper and decorated with buttons. I made a muslin of the bodice first, tweaked the pattern to fit me, and then cut and sewed it together. I wasn’t going to add the petticoat, but at the last minute I decided that I should just go for it and make the dress as directed. I drove to the nearest fabric store, 40 miles round trip, and bought 3 yards of lining and 3 yards of crisp veil-like fabric for the ruffle. I sewed French seams on the petticoat and machine gathered the 8 inch ruffle that attaches to it. 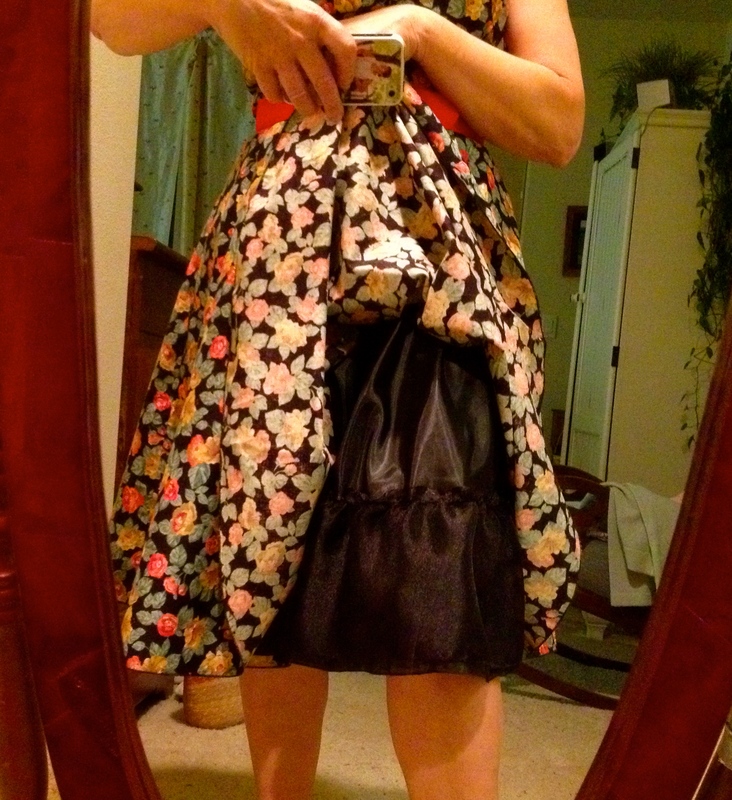 I was able to roll hem the ruffle, the petticoat, and the skirt bottom on my serger. I used wooly nylon on the upper looper and it worked like a dream! 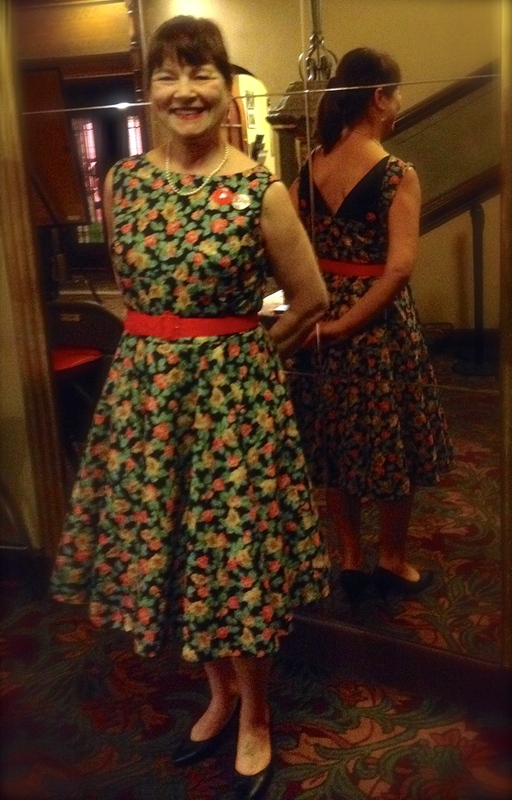 I covered two buttons with the dress fabric, and inserted an invisible zipper. 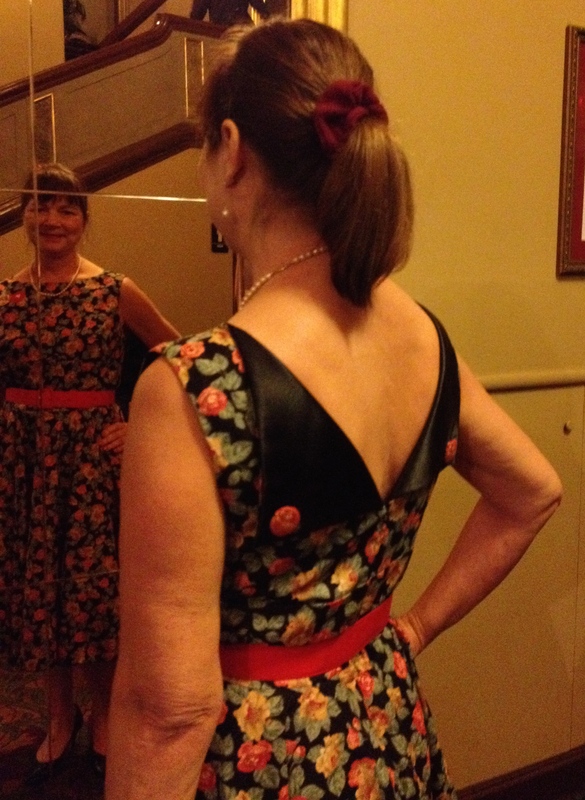 The lining was turned and hand-sewn inside the bodice and along the zipper tape. 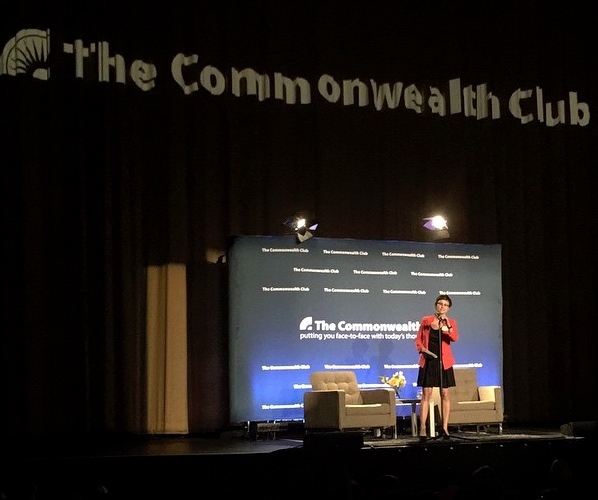 At the reception, my daughter who works for the Commonwealth Club introduced me to Tim and we posed for pictures. I told Tim that I had made my dress. He was very impressed! 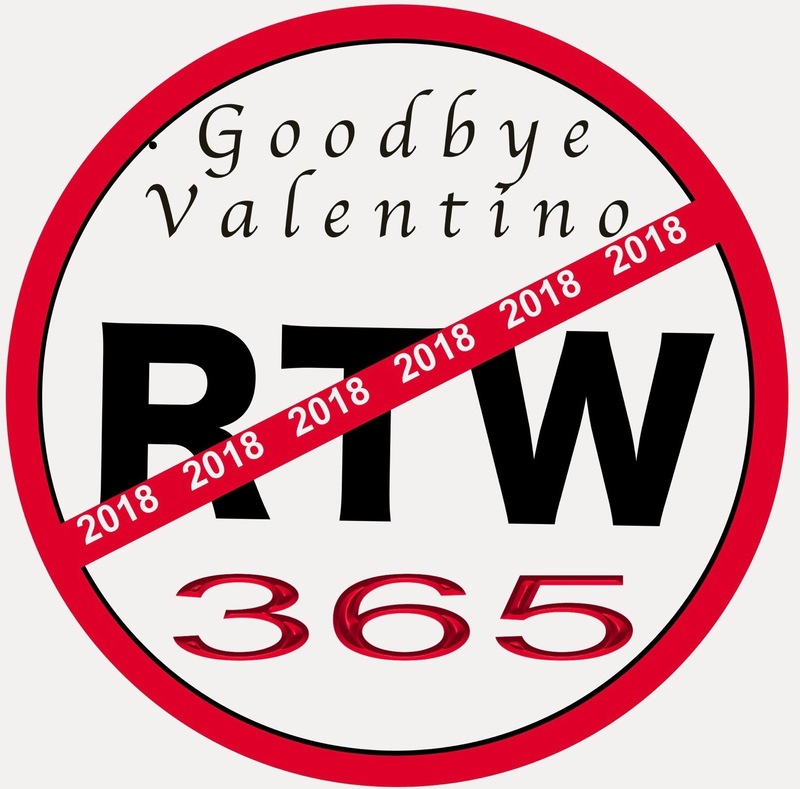 I wore my RTW faster pin proudly and was delighted to explain that all of us fasters had pledged not to buy ready-to-wear clothing. Our goal is to make everything. You can see by his studious look that he was intrigued. This is definitely my best and favorite dress of all time. It is so lovely that I have planned to make another one to wear to my daughter’s wedding in October. It will be made of silk chiffon and taffeta. It might be the next best thing I make! Enough talk already! Here are some more pictures! 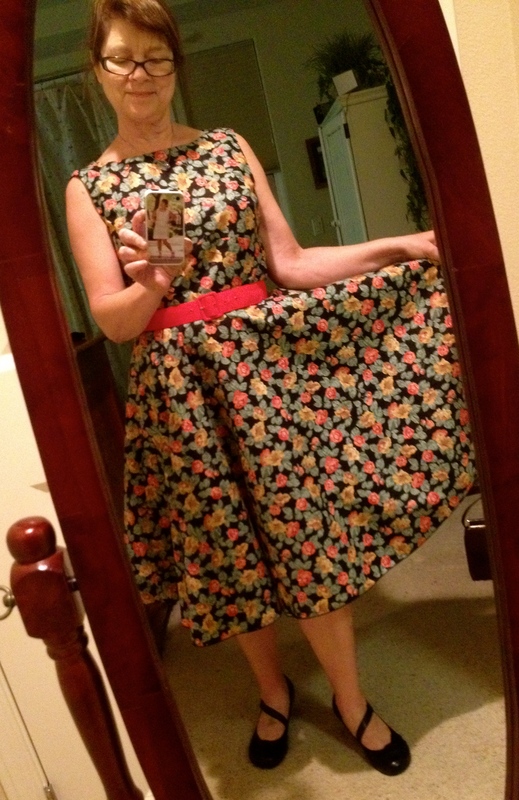 Thank you, Hannah, for snapping some cute pics of this darling dress! 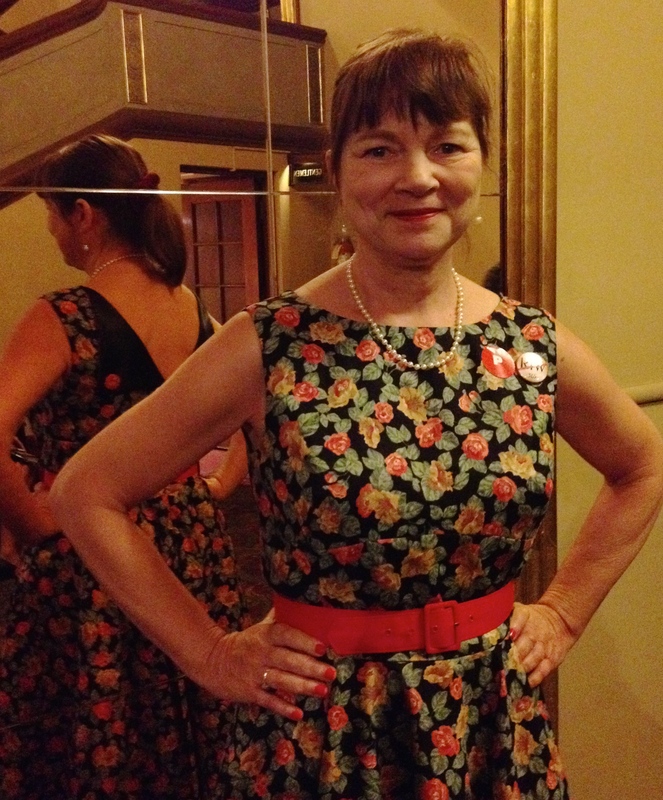 This entry was posted in Art, Blogging, DIY, Family, Fashion, Sewing, theatre, Tutorial, vintage, Vintage sewing and tagged Best Dress, Butterick 6094, Castro Theatre, Commonwealth Club, fashion, floral, Kimberly Maas, Patterns by Gertie, Peticoat, Project Runway, quilting cotton, rolled hem, serving, Sew Mama Sew, sewing, The super online sewing match II, Tim, Tim Gunn, Tim Gunn:the Natty Professor. Bookmark the permalink. you go girl. I know you can do it. Congratulations on your progress thus far. 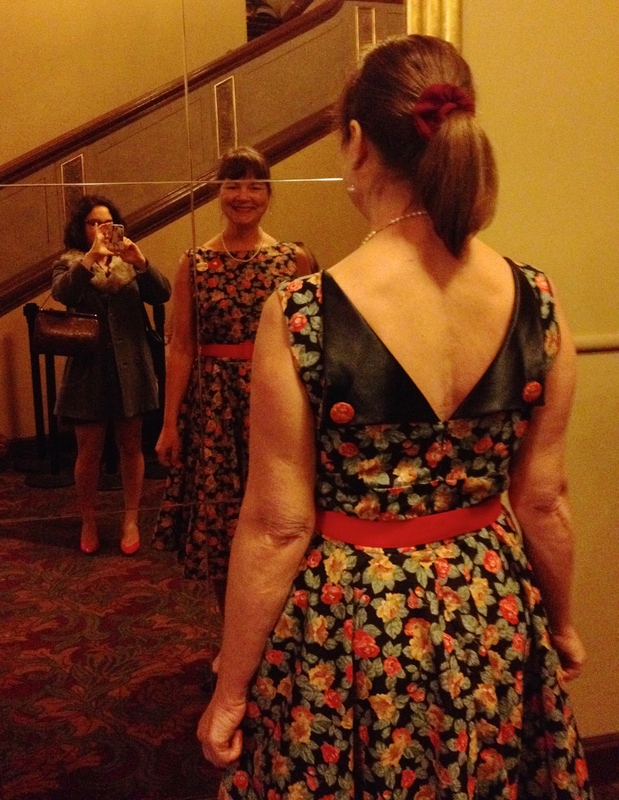 The dress is a delight – I particularly love the back detail. 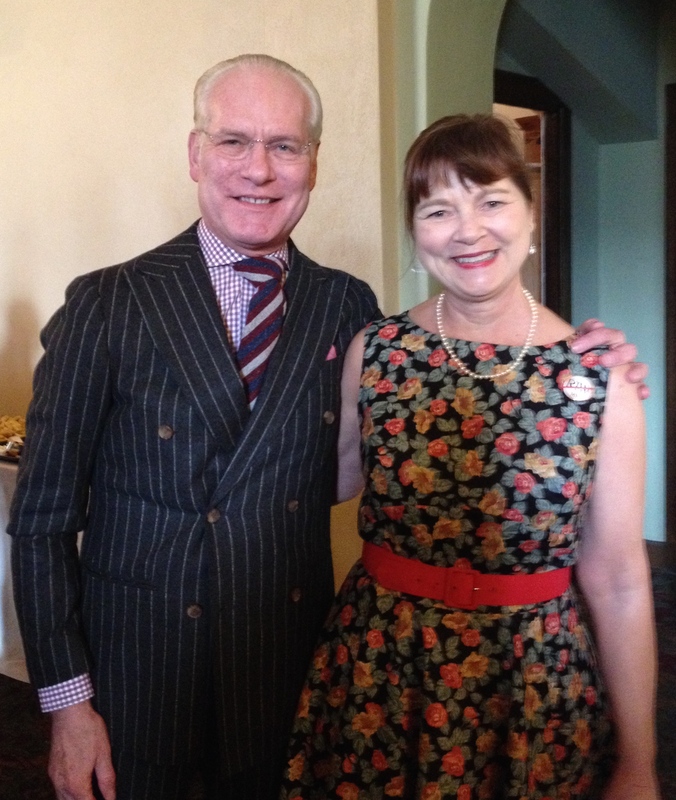 I can imagine that the dress you made to meet Tim Gunn would have to be perfect. How fun! You look beautiful in this dress. No wonder you love it! Lovely dress — love the back details. Well done for reaching the next round. How do you plan to use the taffeta and chiffon in your MOB dress? Pingback: Challenger Question Round FOUR: What’s the best thing you’ve ever sewn? 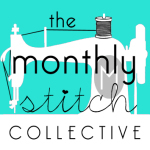 | Sew Mama Sew | Outstanding sewing, quilting, and needlework tutorials since 2005. Love the dress! It is beautiful. The back detail is especially nice. Your dress is gorgeous! 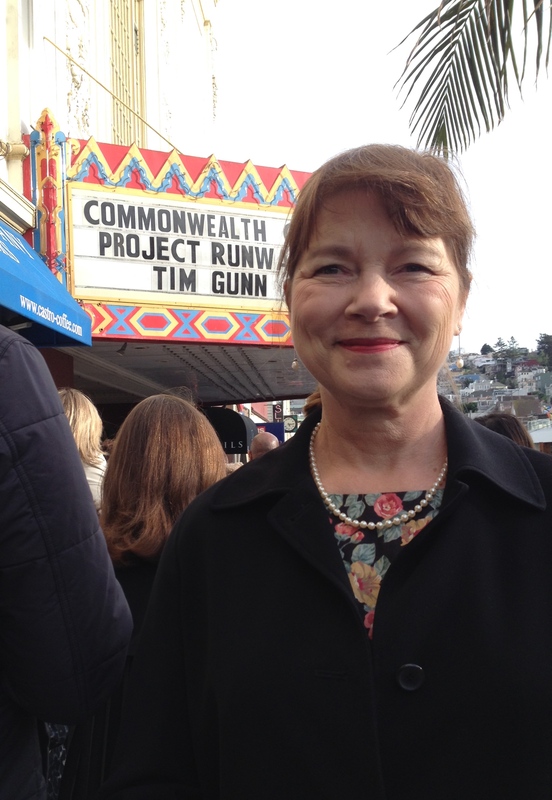 I have never heard of Mr. Gunn, but he needs a little runway advice himself; his suit jacket is WAY too tight and pulling hard against the button, and his sleeves are too short. 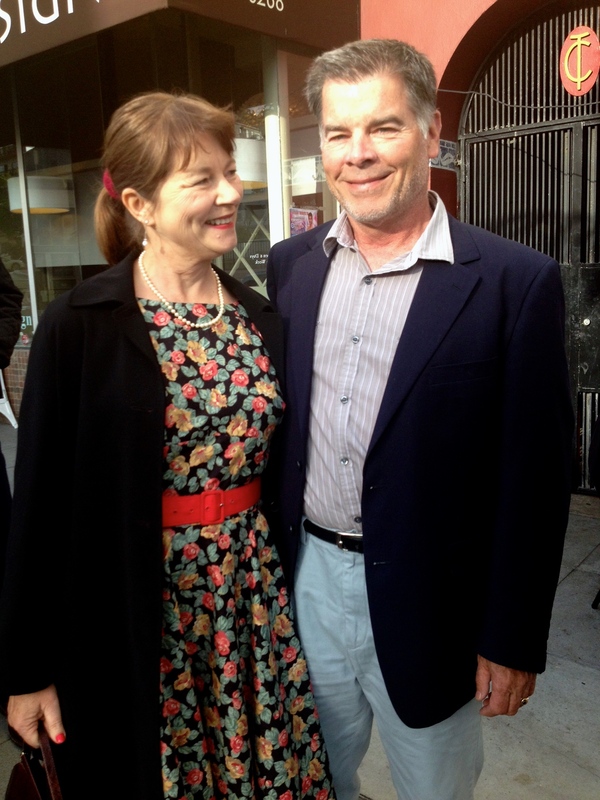 His tie was askew, also. You showed him perfection! Attagirl! I agree with you, chilebeanz! 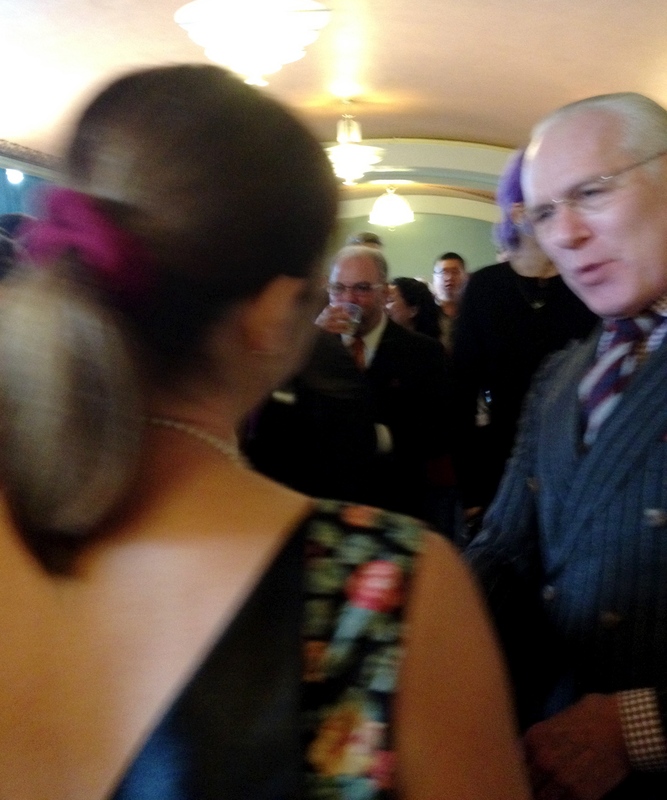 You look fabulous 🙂 Mad jealous of your Tim Gunn meeting self. It’s beautiful! And the back is amazing! !